As we all know by know the pitchf/x data is an incredible resource for baseball analysts. For each pitch thrown in a major league game we get scads of data, so much so that it is hard to even know where to begin. And once we have begun it is easy to just go with the flow of analyzing what others have analyzed. At the PITCHf/x summit Alan Nathan noted that one piece of information, the break of a pitch, is rarely looked at in pitchf/x studies. MLB's GameDay calls movement: (images and descriptions from MLB Advanced Media here). The Pitch-f/x or 'PFX' value is the distance between the location of the actual pitch, and the calculated location of a ball thrown by the pitcher in the same way but with no spin; this is the amount of 'movement' the pitcher applies to the pitch. A faster, straighter pitch like a fastball will have a higher Pitch-F/x value than a slower, breaking ball like a curveball. As stated this leads to the counterintuitive result that fastballs 'move' more than curveballs. 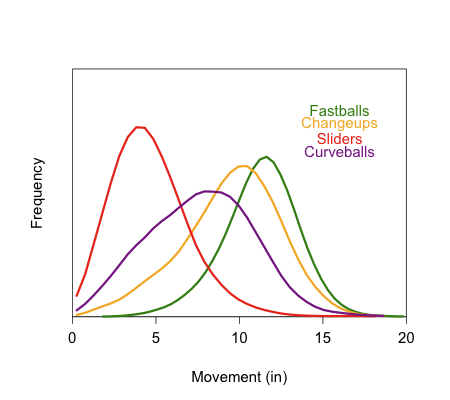 Here is a histogram of the movement of the four main pitch types. Here his how GameDay defines the break of a pitch. Break is the greatest distance between the trajectory of the pitch at any point between the release point and the front of home plate, and the straight line path from the release point and the front of home plate. Curve balls and sliders will have larger break value than fastballs. Pitch trajectories shown in blue indicate breaking pitches. This leads to a more intuitive result that fastballs break the least and curves the most. 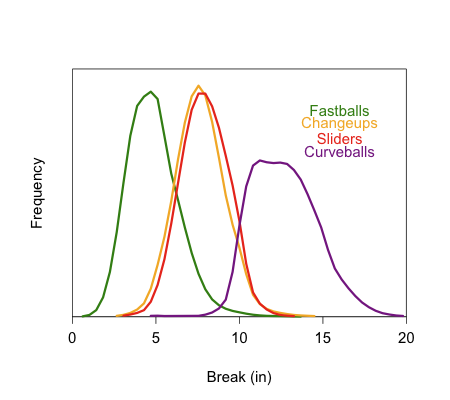 Here is a histogram of the 'break' in inches of the four major pitch types. In my posts where I have examined the results of a pitch by its movement I have exclusively used the PFX or movement value, which is often broken up into its vertical, pfx_z, and horizontal, pfx_x, correspondents. These are often used to produce the horizontal versus vertical movement graphs that are show the different pitch types of a given pitcher. 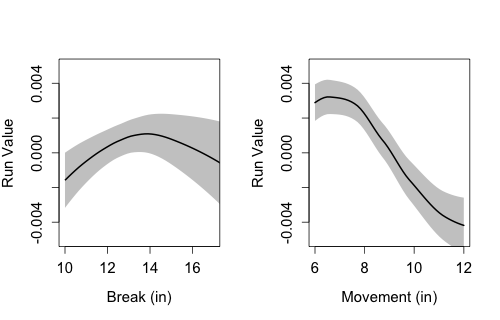 Since break is a more intuitive value I wanted to know if it did as well at predicting the results of a pitch as movement. Here I will just look at curveballs, which I assume is the pitch whose outcome is most impacted by its break. Here is the run value (again negative is good for the pitcher) of a curveball based on its break, on the left, and movement, on the right. The gray indicates the error. As you can see if you could choose just one piece of information, the break or the movement, of a curve in order to predict its success you would definitely choose movement. The error bars are smaller and non-overlapping. That is if you have a curve with 6 inches of movement it is quite likely to have a different run value than one with, say, 10 inches of movement. On the other hand if you have a pitch with 10 inches of break on average its run value is lower than one with a break of 14, but we are no where near as certain. It is too bad, the intuitive value is not as good a predictor as the non-intuitive value. Still it is an interesting piece of information, which is currently not often reported or examined. As stated this leads to the counterintuitive result that fastballs 'move' more than curveballs. Couldn't we counter this by moving the location of the reference pitch to the location of a fastball? Often you hear scouts/evaluators describe pitches as having “late break” or "late movement", and I’m wondering if pitch f/x provides information on this (or if such a thing actually exists). For example, 2 pitchers throw similar 90mph fastballs that move 5 inches into a right-handed batter — is it possible that pitcher A’s fastball starts its movement at 40′ and pitcher B’s begins at 45′ (and is therefor 'nastier' for having moved the same distance in a a shorter amount of time)? Does pitch f/x quantify this sort of thing? Or are the flight paths of pitches thrown from the same release point that have the same velocity and final movement values as they cross the plate created equal? If I had to guess I'd say they probably are, but so many variables go into physically making a pitch, I'm curious. Any thoughts? Let me point out one thing that Dave did not emphasize strongly enough: "break" includes the effect of gravity but "movement" does not. Thus, a 4-seam fastball with lots of backspin has very little break (since the upward Magnus force partially cancels the downward force of gravity), but lots of movement (due to the upward Magnus force). A curveball has topspin and therefore a downward Magnus force that acts in the same direction as gravity, producing lots of break. The relative difference of break between a 4-seamer and curveball tends to agree with people's intuition. JB, I think the break length data in Gameday refers to the distance from the plate at which the "break" value is set, the peak deviation from the reference path. Late break is a myth. It's certainly not going to be captured in pitchf/x data, where acceleration is assumed constant. I agree late break is a myth, at least in the sense that the trajectory of pitched balls are pretty much governed by the laws of physics, which tell us that the trajectory has to be pretty smooth. And certainly the constant-acceleration fit to the trajectory is necessarily smooth, as your comment indicates. However, it is also true that there is a *perception* of late break. In my view, the challenge to pitchf/x analyzers is to identify the characteristics of the smooth trajectory that give rise to the perception of late break. Josh Kalk's THT article from last year (http://www.hardballtimes.com/main/article/anatomy-of-a-pitch-slider/) is a start in the right direction. Apologies to viewers of The Book blog, where I have posted a similar comment already. I think the break has to be adjusted for velocity. A ball lobbed to home plate with no spin would would have a very large break, like a slow-pitch softball pitch. The interesting number is the difference in the break between the actual pitch and a pitch thrown at the same speed with no spin. Part of the break of a slow curve is just the normal arc of a slowly thrown ball. Late break is possible, theoretically. Sometimes when the ball is thrown the axis of the spin is not aligned with the direction of the ball (you want it to be perpendicular to the direction of the ball for max pressure differential). If the axis of rotation changes from being parallel to the direction of the ball to being perpendicular to the direction of the ball, while it the ball is on its way to home plate, the ball can curve more sharply towards the end of its flight to home plate. An example of a pitch whose axis of rotation is parallel to its direction is the gyro-ball or fake slider. But the axis of rotation can change relative to the balls direction, during its flight. A gyro-ball can turn into a true slider as the axis of rotation becomes more perpendicular to the path of the ball as it nears home plate.